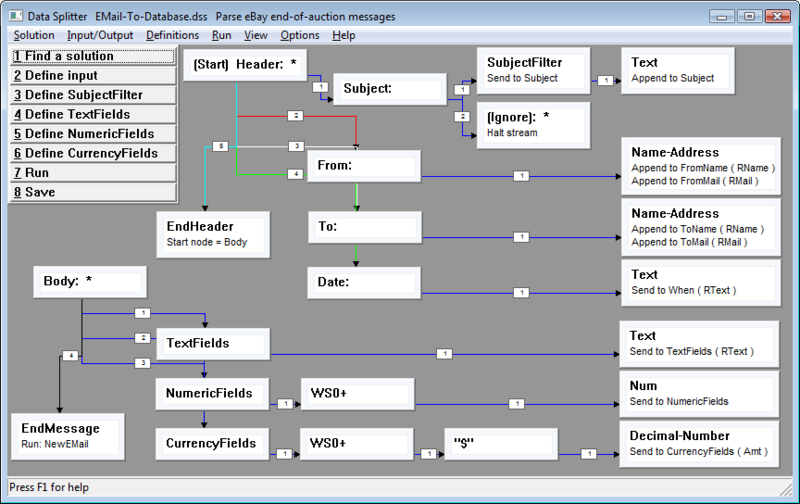 For each email in an input folder Data Splitter loads the header and body as a single input stream. The header and body are separated by a blank line, per SMTP specifications. The techniques described in the Data Splitter tutorial can be used to parse emails. Notice that the header and the body are parsed separately. While parsing the header the start node is set to "Header". While parsing the body the start node is set to "Body". After "EndHeader" (the first blank line) is recognized the start node is set to "Body". The start node must be reset to "Header" in the pre-stream actions. This practice is advisable for parsing emails whose bodies may contain header contents ("Subject:", "From:", "To:", etc. ), for example: when replying or forwarding. Note the use of a null node, "EndMessage". The null node is recognized at the end of the input stream (email body). The values collected from the email are sent to the database at that point by action group "NewEMail". label ... spaces ... data ... end-of-line. A label is descriptive text, typically followed by a colon, for example: "Item name:". This solution also makes use of a database / ODBC connection. File "SQL.txt" accompanies the installation: it contains an SQL statement for creating the "eauction" table used by this sample.